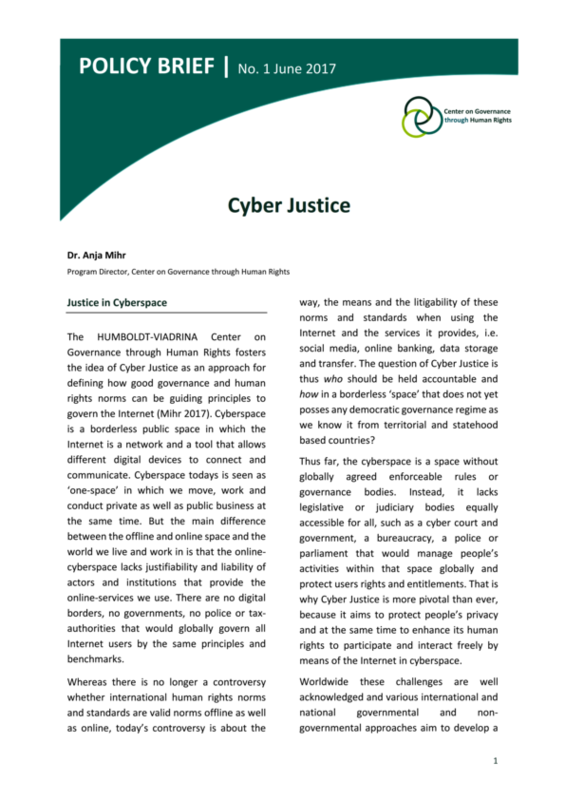 Cyber ​​justice means protecting and promoting human rights on the Internet and in cyberspace and regulating the interaction between providers and Internet users. This is also the goal of a cyber-society contract, the development of which is supported by the Center. The implementation of fundamental freedom as well as all social and economic human rights and the Sustainable Development Goals are no longer conceivable without the Internet. Whether it is freedom of opinion or information, privacy or protection of bank data, freedom of assembly in and organization of political groups on social media, freedoms and fundamental rights are often restricted. At the same time, cyberspace and the Internet provide more opportunities than ever for more participation in political processes and economic development. But so far, the community of nations has not managed to protect or promote human rights adequately either offline or online. Despite all state, regional or international attempts at the UN or EU level, the increasing number of users and providers on the Internet is subject to a dynamic of its own, which cannot be tackled by “market or self-regulation” alone. The Center advises and evaluates current processes in the emergence of more cyber justice. [+] Event series 2017 " Governance through human rights in the digital space"
The question on how to improve governance through human rights in the digital space has become more and more pressing in recent years. What can digital governance look like that involves human rights and fundamental freedoms? What are the opportunities and risks of the Internet for the fundamental rights and right to freedom, when the the security and credibility of NGOs, companies and governments need to be protected in the network at the same time? Personal rights, the right to freedom and fundamental rights are discussed in cyberspionage, cyberwar, whistleblowing, the abuse of personal data and the protection of privacy. The Internet, however, opens up new business models, which partly collide with these rights or even restrict them. The series of events takes a look at the different aspects and approaches to the protection but also the lack of protection of our freedom in the cyberspace. The conference series took place in Berlin in partnership with the Konrad Adenauer Foundation, the Viadrina Center Internet and Human Rights, Reporters Without Borders, the Universität der Künste and Posteo in Spring / Summer 2017. The cyber-space, in which a third of humanity “moves” every day, offers new opportunities, but also the risk of violating rights. In order to discuss this relationship with representatives from academia and daily professionals, the Working Group on Human Rights of the German Association for Political Science (DVPW), together with the Schader Foundation, invited the “Human Rights in Cyberspace” conference on December 4, 2015 to the “Schader Forum” Darmstadt. The conference was supported by the HUMBOLDT-VIADRINA Governance Platform and the Center for Internet and Human Rights, the European University Viadrina and in cooperation with the Fraunhofer Institute for Secure Information Technology (SIT). Information on the conference can be found on the website of the Schader-Stiftung (in German). In the course of the event, Ben Wagner, director of the Center of Internet and Human Rights (CIHR) of the European University Viadrina, Frankfurt / Oder and Dr. Anja Mihr, lead of the Center on Governance through Human Rights, published a joint contribution with the results of the workshop (in German). The Marshall Center has developed an extensive course to address the growing national, international and transnational cyber threats. The aim is to provide a comprehensive cybersecurity program, focused on policy and not on technology, in order to provide key players with information on decisions regarding cyberpolitics, strategy and planning within the framework of cooperative overall governmental approaches. Dr. Anja Mihr gave the keynote speech on cyber justice and human rights in cyberspace at the PCSS on December 3, 2015. Dr. Anja Mihr und Joanna Bronowicka, Center for Internet and Human Rights lead the session „When governance hit „Like“ on the „War on Terror“ at the UN Internet Forum (10. November – 13. November 2015).